For what seems like the umpteenth time, Spider-Man is back on the big screen. But this year, when Hollywood is under the microscope on the hot-button issue of diversity, the superhero is half-black and half-Latino. Step aside, Peter Parker. There’s a new Spidey in town. Hello, Miles Morales. Miles as Spidey is not new to comic book enthusiasts, but he is new to theatre-goers, who earlier this year embraced the long-awaited arrival of the Marvel universe’s first black hero, Black Panther, on the silver screen. “Spider-Man: Into the Spider-Verse,” which hits US theatres on December 14, is a free-wheeling animated look at the multiple Spideys in parallel dimensions, including Spider-Ham (yes, a pig) and two women. This time, an older Parker is a mentor to Miles, who is voiced by 23-year-old Shameik Moore, an Atlanta-born actor and singer with Jamaican roots. Long before Moore landed the major role, he hoped he would get the chance to play Miles, he told AFP in an interview. He had even written about it in a journal given to him by a friend. “One of the things I wrote in there very early on was, ‘I am Spider-Man. I am Miles Morales,'” he said. Moore first drew notice in the well-received indie film “Dope” in 2015. He says being chosen to play Morales is as rare as… being bitten by a radioactive spider. “That spider chose him. However, many thousands of people live in Brooklyn… Sony chose me to play Miles Morales out of the hundreds of thousands of people that auditioned,” he recounted. The film recalls the visual style of the original comic books, with less refined art and speech balloons that appear on the screen. Its release comes one month after the death at age 95 of the character’s creator, Marvel legend Stan Lee. But the man behind a stable of heroes, from The Hulk to the X-Men, is still present — he is listed as an executive producer and, as is customary for Marvel films, Lee has a cameo appearance — in animated form. 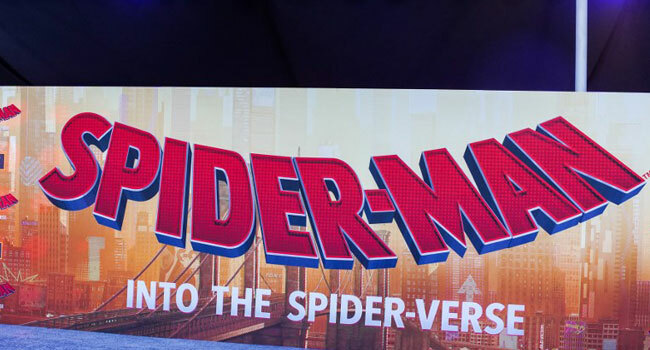 The cast features Oscar winners Mahershala Ali (Miles’s uncle) and Nicolas Cage (Spider-Man Noir), and Oscar nominees Hailee Steinfeld (Spidey’s love interest Gwen Stacy) and Lily Tomlin (Parker’s Aunt May). The film is generating major buzz and currently has a 100 per cent “fresh rating” on Rotten Tomatoes, which aggregates reviews from critics. The idea for a Spider-Man of colour first took hold in 2008, when Barack Obama was elected US president. Miles, whose father is black and mother is Latina, first hit comic book stands as Spider-Man in a parallel universe in 2011 following Parker’s apparent death. In an animated television version, of-the-moment actor-musician Donald Glover voiced Miles. But a film adaptation always seemed likely, as Tinseltown works to show that not all superheroes have to be white men. “Black Panther” and “Wonder Woman” stand as proof that fans are ready for different heroes. “Everything is based off the business,” said Jake Johnson, who plays Parker in the film.